နိုင်ငံတော် သီချင်း: ¡Oh, Gloria Inmarcesible! 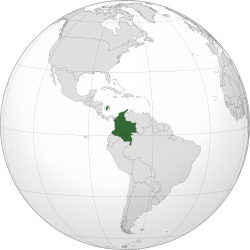 Although the Colombian Constitution does not specify the Spanish as official language in all its territory, the native languages (approximately 75 dialects) are also official in their own territories. The official Colombian time, (horalegal.sic.gov.co) is controlled and coordinated by the state agency Superintendency of Industry and Commerce. ↑ Stokes, Doug (July 1 2005). "America's Other War: Terrorizing Colombia". Canadian Dimension 39 (4).